This is a spectacular recording of one of Handel’s great oratorios, both from the point of view of the performance and the overall production. Since its foundation in 1979 Les Arts Florissants has performed music from the Baroque era in an historically informed manner, but without the fussiness and/or dryness found in so many other HIP performances. Compare this recording to Nikolaus Harnoncourt’s on Warner Classics (coupled with Jephtha, and very well sung in both cases). There is a natural ebb and flow to William Christie’s conducting, a responsiveness to all aspects of the text without ever turning mannered, that seems a strong contrast to Harnoncourt’s more manipulative and less generously phrased conducting. Christie provides sufficient rhythmic tautness but his emphasis is clearly more on the lyrical beauty of the music. Attacks are less fierce here; the tension never sags, but neither does it dominate. This is, in fact, a performance of great beauty and great energy, two qualities in perfect balance. There are different editions of Belshazzar, as Handel made or accepted revisions as necessary in order to guarantee performances. Christie and his associates have, to quote him, “chosen what we consider to be the most successful of the various versions of Belshazzar given in his lifetime, resulting in the restoration of the piece in all its splendor, with the best of the music and a coherent libretto.” I have not made a direct comparison with other recorded versions as to editorial choices, but the result here is certainly coherent and convincing as a whole. An excellent essay in the accompanying booklet goes into greater detail about the different versions. 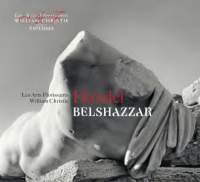 The accompanying material, both the main booklet with excellent notes and a complete libretto, and the second smaller booklet containing an essay about Belshazzar’s kingdom of Babylon by Jean Echenoz, is exemplary in its presentation of Belshazzar. This is the first recording on Les Arts Florissants’s own label, and they have set themselves a high bar for future releases. In the end, of course, one does not buy a recording for its booklets, but for its musical values. Belshazzar has been lucky on disc, with good recordings led by Pinnock and Harnoncourt in the past. The singing is good on all three, but because of Christie’s leadership this would be my first choice. The conducting matters a lot in a work of this length; Pinnock is clean, crisp, but somewhat bland, whereas Harnoncourt is overly intense and driven. Christie manages to find the suppleness and the energy in the score and give them equal attention. Even the recitatives have shape and momentum, something not always the case in other performances. Rosemary Joshua’s Nitocris is spectacular. Her bright soprano has both intense focus and a warm glow to the sound, and she is at ease with all of Handel’s coloratura demands. Allan Clayton’s tenor is equally accomplished; though his voice itself is a touch on the dry side, he sings with ease and style and he conveys the bluster and debauchery of Belshazzar quite convincingly. The scene featuring his final aria, before he foolishly and drunkenly goes off to battle where he is killed, followed by a brilliant Battle Symphony, is extraordinarily dramatic and effective here. The other singers perform at a very high level throughout—consistency of quality and of style is a hallmark of this recording. The recorded sound is warm and well balanced, with the perspective of a seat perhaps upstairs in a concert hall or opera house rather than close-up. In all ways, then, this is enthusiastically recommended.